Time has a way of softening things; so it is with medieval castles converted into romantic getaways, like the lovely Pousada Castelo Óbidos, located just inland from the ocean, a short drive north of Lisbon. There’s quite a colorful history here involving falconry, fierce battles, and child brides. But you don’t need to worry about that when you’re wandering through the gardens or relaxing with a glass of wine on the stone terrace. A stone terrace called Porta da Traição — the Gate of Betrayal. Suffice it to say that the castle had its moments back in the 13th century, but it’s probably quieter, and altogether more romantic, today. Now managed by the upscale Pestana chain, has just seventeen rooms, spread between the original castle and a newer “cottage” wing. The castle rooms have the thick walls, quaint hand-painted tiles, wooden shutters, and darkly romantic atmosphere you’d expect of an old and tastefully restored fortress. 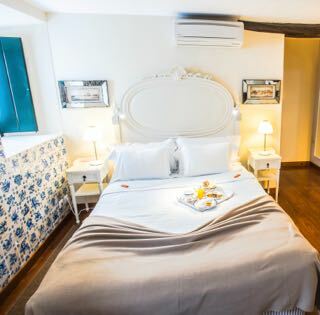 The cottage rooms have a brighter, more modern feel, though the blue and white color palette, and the four-poster beds, still look traditionally Portuguese. All guest rooms are spacious and lit with chandeliers — befitting a place where kings and queens used to sleep — and stocked with high-end amenities, from bed linens to bath products. Superior cottage rooms and cottage suites have balconies or terraces, not to mention fireplaces where you can really get into the spirit of medieval times. Beyond guest rooms and suites, the castle is a delightful place to walk around. Unlike some historic landmarks converted into hotels, the Castelo Óbidos hasn’t been stripped of its personality and recast with minimalist furnishings and mood music. You’re still bound to bump into a coat of armor here, and the occasional oil painting. The buffet breakfast, featuring an array of Portuguese pastries you won’t find outside these particular borders, feels royal, indeed, and the village of Óbidos, with a range of of down-to-earth wine bars and cafés, is just a short stroll away. Why romanticize the past? The present looks pretty good in this town. How to get there: Pousada de Obidos Historic Hotel is located approximately 80 km by car from Lisbon Portela Airport via A8.